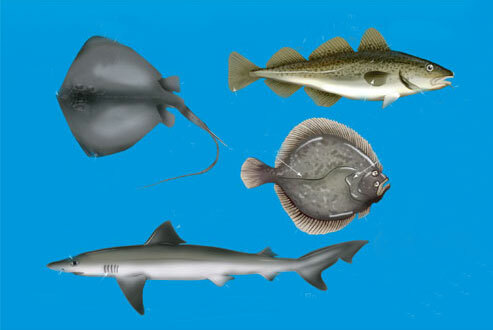 UK waters offer a diverse range of fish species. Some are resident, some migratory, some are bottom dwellers, others pelagic (swimming near the surface). We even have some sub-tropical visitors. Many have suffered from commercial exploitation, leading to depleted numbers and a smaller average size. Others (usually prey fish) have thrived because of the demise of the exploited species, while some newcomers have arrived either as the result of a more plentiful or untapped food supply, or because of global warming. Sea angling success can vary, depending upon where you live and fish. It is also affected by water temperature – there is a southern and a northern migration pattern of summer and winter species throughout the year. However, recent warm, prolonged summers have meant that many of the southern species now range much further north, and their season extends longer. One thing that has not changed is that the catching of sea fish requires effort on the part of the angler. The ‘chuck it and chance it’ approach of the past is most inappropriate today. Nowadays a bigger emphasis is placed on finding the fish, and with travel so easy many successful sea anglers follow the peaks of species through the seasons. The families of fishes found around the UK are divided into several groups – flatfish, rays, sharks, gurnard, eels, ling, codfish, wrasse, bream, mullet, mackerel, scad, garfish and bass. There are several other species groups among the smaller fish – mini-species – which are not always direct angling targets, but sometimes serve as bait. Among them are dragonets, pogges, weevers, gobies, blennies, rockling, herrings and sandeels. April, May: Spring sees the common shore crabs start to peel around many parts of the UK coast and this attracts bass, eels, pouting, flounder, codling, plaice, ray, dogfish, smoothhound and others inshore. After the rigours of spawning, many of these are hungry. June and July: Summer arrives in the south of the UK with species like tope, smoothhound, ray, mackerel, garfish, scad, pollack, bass, mullet, gurnard, bream, plaice and sole continuing to arrive and spreading north. The baitfish – sprats, sandeel, mackerel and scad – are shadowed by many of the larger predators as they move north. On the west coast of the British Isles the Gulf Stream speeds the species surge north, while on the east coast the cold North Sea slows the northern migration. July is a month for the unusual – some of the rarer breams, rays, trigger fish and wrasses. August: This can be a month when some species bypass venues in the far south – everything has moved north – but regional temperatures and sunshine can have an effect. Further north, August can be one of the best months of the summer for mackerel. September and October: Usually a time of plenty in many regions, with the summer species like bass, mullet and ray having reached their maximum range and starting to overlap the resident and winter species like cod, whiting, pouting and dabs. The mix can produce some spectacular results, and this time is the best in most regions for specimen fish. It's also when most of the unusual or rare species extend their range furthest. November and December: A time when the bigger bass and the bigger cod feed inshore on their way to their winter spawning grounds. Both take advantage of the carnage of the winter gales moving closer to shore. Generally bass start to move south, cod north at the end of this period, although in some regions both species move back into deep water. Seasonal cycles of species like cod produce an overlap of fish inshore when food is short and hungry mouths many. Lean cod years will see a shortage of bigger fish. The weather changes in many regions at this time, and sea anglers have to be able to cope with low temperatures, wind and rain. The rewards for lasting the course are the bigger fish! Lots of whiting, dabs and codling will keep the rod nodding in most regions. February and March: The slowest time of year in many regions. The bigger fish will have moved away from the shoreline to spawn, and only immature fish and a few localised species like flounder remain. Many common species have a liking for a particular marine location – it could be a specific sea feature like a reef, gulley, rock face or estuary. Here is a general overview of what species are found where. Remember, though, that migration can place species in venues they are passing through, which is why this is a guide rather than a hard-and-fast rule. Cod: Have a liking for deep water and strong tide which they use to travel to feed. They are found over clean and mixed ground, but can become localised among rocks and reefs, where they take on the colour of the kelp – so-called ‘red’ cod. Bass: Small school bass are caught in estuaries and from surf beaches, especially when a large surf is running – then they often feed inside the main breaker. The bigger fish hunt around reefs and piers, especially in the shadows of harbour lights, and in fast tidal runs or anywhere easy food is available. 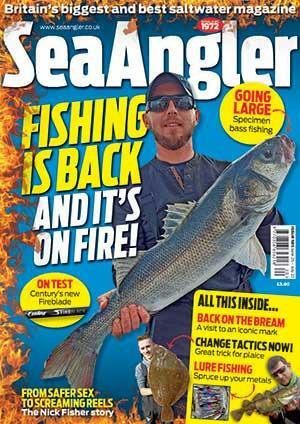 Many piers where anglers gut mackerel and throw the entrails in the sea are home to some big bass. Pollack: These are found on or off the sea bed behind pier piles, under weed fringes or close to pier walls, cliff edges, reefs or the edge of the tide flow. Mullet: Active near the surface in calm water marinas and harbours, they can sometimes be spotted under boats, or around wind-blown flotsam. Find them feeding on the outer sea side of piers and they will be less timid. Wrasse: Often located up off the sea bed around rock edges, pier piles or weed fringes. They are very localised in shoals – find one and there will be others. If you don't get a bite, move. Wrasse don't feed at night. Conger: They can be very localised to a particular area of rock, holes in pier walls, the bases of cliffs or patches of rough ground. Nocturnal, they often venture out of their lair under cover of darkness to feed. Sole: A nocturnal species, they are found on shell grit beaches, feeding in the last hours of darkness, or in coloured water, often very close to the shore. Plaice: They prefer a sandy, shell grit bottom, anywhere near pea mussel beds, and sandy patches between rocks and weed. Dabs and whiting: Found over clean, sandy, shell grit sea beds, they like coloured water best in daylight, clear water after dark. Flounder and eels: Both are fish of the estuaries, but are also found on beaches on the edge of estuaries. A major factor affecting shore fishing results is the weather, with wind direction and sea temperature both having a major influence on occasions. Generally a strong onshore wind produces a stirred and coloured sea, sometimes resulting in a sand bar or reef being gouged apart by the waves. The resulting marine carnage spills and kills lots of marine life, which obviously attracts the predators. A calm, clear sea with wind off the land still produces fish, but is generally best fished after dark, when fish are more active and far bolder. Rough, coloured seas in daylight are always more productive for the majority of species. Some wind directions are better than others. An east wind is rarely productive countrywide, and in many regions, if it lasts for any appreciable time, it kills sport completely. A touch of north to an east wind is most productive on North Sea coasts. Alternatively, around much of the south and west coast, any wind from the west or south is productive. Low winter temperatures can also affect how a venue fishes. A low tide mark exposed to heavy frost overnight can rapidly cool the shallow water and send fish packing. Floods and snow water have the same effect. As a general rule, in winter fish only shorelines where you are casting on to a sea bed that is never exposed over low tide.